A masala is of course a mix of things. In the culinary version it is spices that imbibe our food with a texture and tones. In music I guess hip-hop would be the closest to a masala. Art is more difficult. Perhaps modern art would be the best use of the term… Next comes the literary analogy. Books, poems and even our conversations are a masala of terms, dialects and languages. So what better title for a mix of diasporic writers each with our own voice, resonating to the same chord? I’m pleased to that I’m included in this anthology and its now available on Lulu for hard copies and online versions. Check it out! 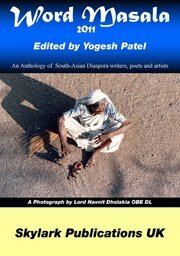 WORD MASALA: Brings together widely published, finest, but grossly ignored non-resident South-Asian Diaspora authors, poets, artist and photographers.